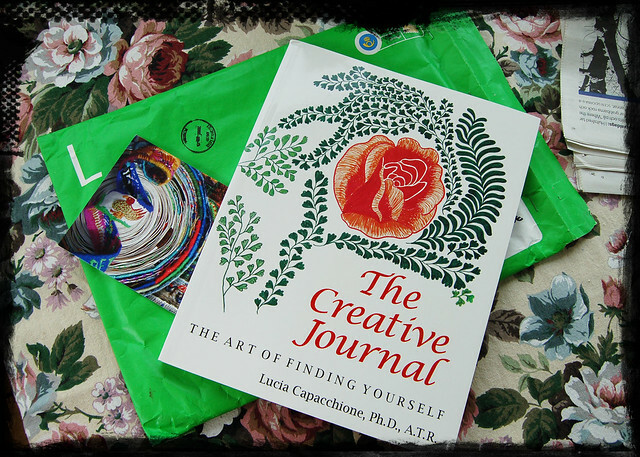 With a beautiful card this book, The Creative Journal by Lucia Capacchione, came in the mail yesterday. It was sent to me from a secret admirer and I was very happy and surprised to receive this unexpected gift! So far I’ve only been browsing through the book and read the first couple of pages (the introduction) but it looks like the perfect book for me! Its filled with exercises to draw, doodle, scribble and write in your personal journal (which I’m doing every day). My copy is from 1979 though it looks brand new (I can’t figure out if it was printed then or more recently). It’s described as “a recognized classic in the field of art therapy and creativity” with “exercises to help you find and love one’s self, get in touch with ones’ feelings, and dreams.” Sound good, right? Isn’t it pretty?! 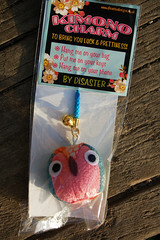 It’s made by Dale Meister of the blog Flight of fancy! I was her visitor number 1000 (!) 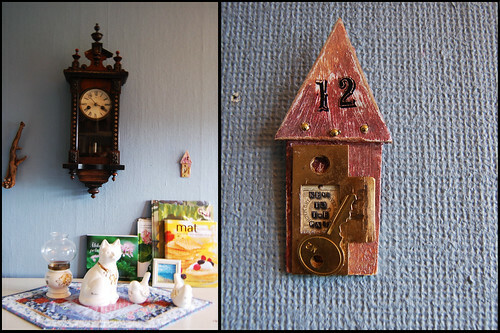 so she wanted to send me little gift, and this house is now hanging on the wall here. Thank you Dale! I’ve also received two owls recently from friends who like to give gifts “just because” (the best ones!). No, not 2 owls; I’ve received one very cute cell-phone charm owl in pink (that is now adorning my moleskine diary) and one black and red wanna-be-owl that I’m lovingly taking care of! Yay for generous and kind friends – they are so… friendly? generous? the best people! I collect good friends, and I love it! I think everyone should collect friends, they are so wonderful to have! 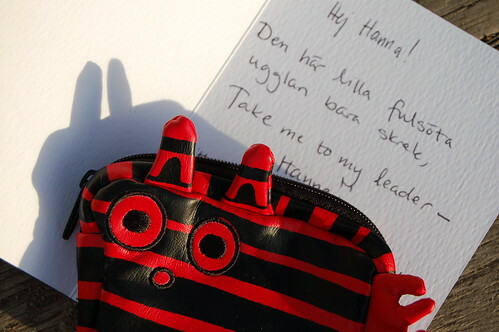 The red owl is a pouch and was accompanied by a special card for special people! The pink owl is bought in Scotland (thank you Lotta!) and the red one in Ume (thank you Maria!). Thank you for these gifts and for all the comments, emails and kind act each one of you do for me (and each other) every day! Spread your kindness around because you can’t save it for later! The owls come from a thrifted embroidery that she incorporated into a handy tote for herself! I just had to snap some photos of the owls because they are so cute. This entry was posted in Mail bliss and tagged gifts recieved, happiness, journaling, owls, reading. Bookmark the permalink. that is generous too! 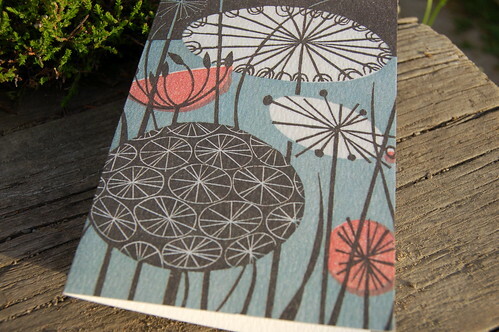 I always get jealous when others receive mail bliss! ;-) Hehe. Hey Hanna! I’m glad to see that you like the house i sent you :). It looks great on your wall there. Thanks again for visiting my blog! “Spread your kindness around because you can?t save it for later!” I love that phrase! Very well put! What lovely gifts for you! You deserve all of it. Ahhh I just finished using that book. It’s excellent but I wasn’t able to do all the exercises in it because it was from the library and I sort of skipped some of the more “down” prompts that I wanted to avoid. :) I love that tote! What great gifties! I’m really enjoying looking at all the fun projects! YAY! I love doing projects. I enjoyed looking at your book on lulu too! :-D SUPER!